Lehi becomes first Utah city to raise legal tobacco age to 21. It may not be the last. 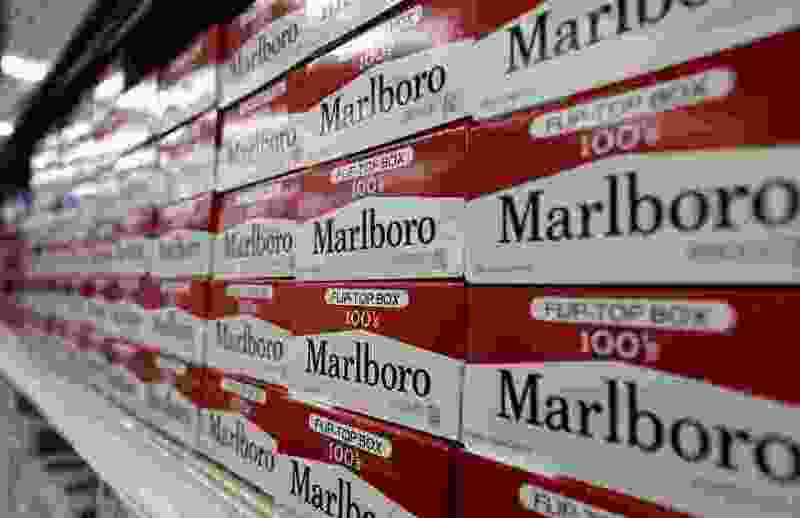 (Gerry Broome | The Associated Press) This June 14, 2018, file photo shows cartons of Marlboro cigarettes on the shelves at JR outlet in Burlington, N.C. There is a move afoot to raise the legal age for tobacco purchase and possession to 21 years old. Lehi • The City Council here approved raising the legal age for tobacco to 21 in what is a first in Utah, where state law allows 19-year-olds to purchase and possess tobacco products. The new ordinance, approved unanimously Tuesday night, also applies to e-cigarettes. It will take effect 20 days after it is signed and posted. Bartlett said there are 425 cities and counties in 23 states that have adopted 21 as the minimum age for tobacco. In neighboring Colorado, the towns of Aspen, Basalt and Avon passed their own Tobacco 21 policies, one after another, starting in 2017. Bartlett said he has noticed that when a city passes a Tobacco 21 policy, other grass-roots movements tend to pop up in other localities and municipalities soon after. Tobacco 21 laws can legally trump Utah law because there is no pre-emptive language blocking political subdivisions from passing more restrictive rules, Bartlett said. Cities, however, can’t set the legal age below 19. Hawaii is one of six states that have implemented Tobacco 21 policies and was the first to do so in 2016. Bartlett said Oregon, California, Massachusetts, New Jersey and Maine adopted similar statutes in subsequent years. Just last week, Richard Creagan, a Hawaii representative, introduced a bill proposing to raise the minimum age for tobacco in his state to 100 by 2024. Utah’s law has set the minimum age at 19 since 1963. But for a half-century before that, tobacco buyers had to be 21 or older, according to Bartlett. Before 1911, the legal age was 18. Localities and states that pass Tobacco 21 measures do ultimately restrict young people’s access to cigarettes and other tobacco products — an important feat, Bartlett said, as research shows the younger someone starts tobacco use, the more likely he or she is to become hooked. Brook Carlisle, director of government relations at the American Cancer Society Cancer Action Network, said about 95 percent of adult smokers become addicted before turning 21, the majority of whom begin smoking sometime after reaching age 18. “If you can delay tobacco use until after 21, the chances that people are going to pick up a tobacco product and become a daily user go down astronomically. So the longer you can delay use, the better it is for the health of an individual,” Carlisle said, indicating her support for Lehi’s ordinance. She debunked the perception that tobacco is not an issue in Utah, where most residents are members of The Church of Jesus Christ of Latter-day Saints, which eschews tobacco use. Carlisle said about 800 Utah kids become daily smokers each year. Data show that kids are using electronic cigarettes, small plastic tubes that give off a variety of different scents, at an increasingly widespread rate. “It only makes sense and is the right thing to do to include electronic cigarettes in any Tobacco 21 ordinance,” she said. Rep. Steve Eliason, R-Sandy, introduced a bill in 2018 proposing to hike legal tobacco age to 21 statewide, but the legislation ultimately failed. Carlisle said Eliason is sponsoring the same legislation this year. “We would love to see a statewide ordinance,” she said. Similar bills have been introduced every legislative session for the past seven years. None has passed. During Tuesday night’s council meeting, DeAnn Kettenring, a Lehi resident and member of the Utah PTA, said upping the age to 21 makes sense because there are already laws restricting youths from drinking alcohol, renting cars and owning weapons. City Councilman Mike Southwick said that although there are ways for youths to get around the new ordinance, it is still worthwhile. Editor’s note • Brook Carlisle is the spouse of a Salt Lake Tribune reporter.